Here am sharing a special sardines fish fry with green masala. Yet another healthy fish fry recipe using raw tamarind, green tomato, raw peppercorns, coriander leaves, curry leaves, garlic, green chilies, vinegar, coconut oil, and salt. In Kerala, this recipe for sardines ( pachapulinga pacha thakkali pachakurumulaku aracha mathi porichath) is very common and very popular sardines recipe. A highly recommended fried fish recipe for all those who are in diet and for all those who are more concerned about health. Even without oil or with less oil, the fish fry remains moist on the inside and crispy brown outside. Trust me, this fish fry recipe is a healthy way to enjoy our favorite dishes especially fish recipes and chicken recipes. I have shared a healthy green chicken recipe a few months back with no oil or less oil. We all know the surprising benefits of eating sardines. Yes, sardines contain the highest source of omega 3 fatty acids along with vitamins and minerals. As sardines controls blood sugar level, it is good for diabetic people. 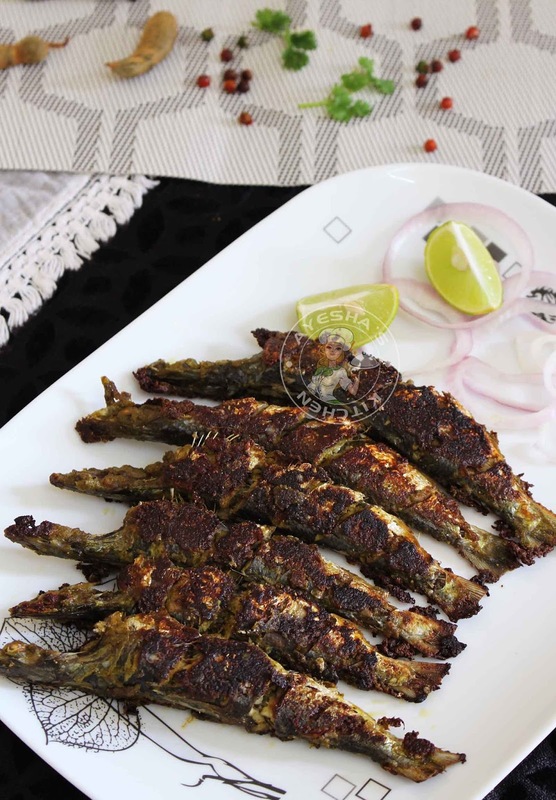 So these healthy tasty sardines fry with green masala is a must try fish fry recipe. 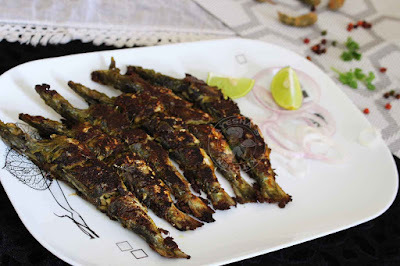 Here is the recipe showing how to make healthy fish fry recipe / green fish fry recipe/fish fry with green masala/recipes for green tomatoes /fry fish food /fish masala /raw tamarind /healthy fried fish /sardine recipes/ sardines fish fry / chala fry/ mathi varuthath / kerala style fish fry / kerala style mathi porichathu/ nadan mathi fry/ fish recipes healthy. Clean sardines and make gashes on it. Now grind together all the ingredients given under ' to grind ' until smooth. Marinate the fish with this fish marinade and set aside. Cook the sardines over a medium flame, covered and later opened until the water in the pan dried out completely. See the detailed pics. When done, sprinkle 1 tbsp of coconut oil over the fish and sides of the pan. Flip the fish when one side is browned. Fry until the fish turns browned and crispy. 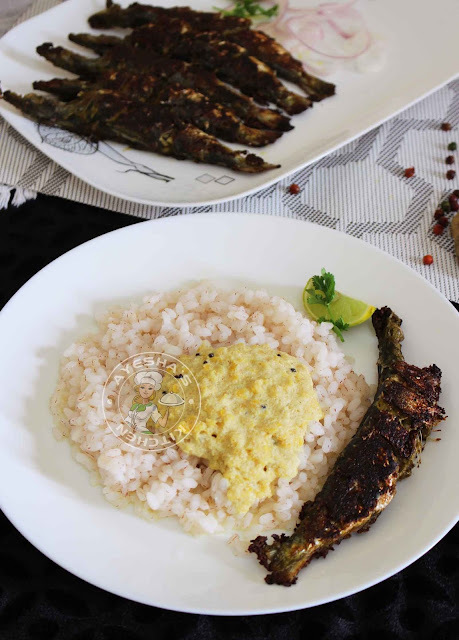 Yummy healthy fish fry or fried sardines with less oil is ready. Serve hot.